For years Captain America has flown the flag for truth, liberty and justice, however he's set to fly the flag for the Marvel NOW! initiative, heading into relaunch worthy series, written by Uncanny X-Force scribe Rick Remender and drawn by Marvel artistic mainstay, John Romita Jr. Describing his plans to iFanboy, Remender calls his run a "hostile takeover", grasping what Marvel NOW! represents. 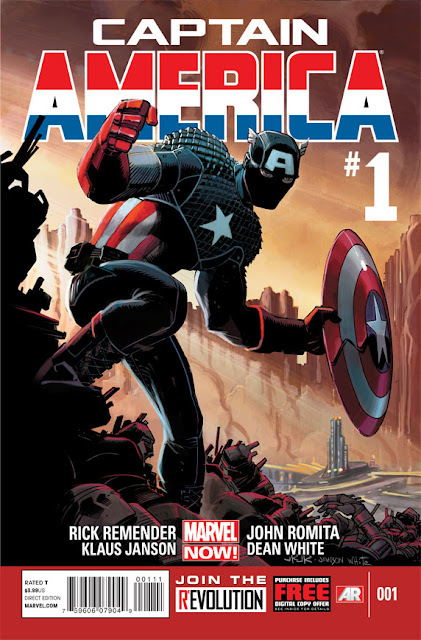 Blasting away from the traits of Ed Brubaker's astonishing Cap run, he is planning to clear the decks of World War II flashbacks, and stack them high in spy/sci-fi concepts, including a 'Green Skull' and an Arnim Zola who is about to move from Red Skull's lackey, to an A-list villian all of his own. With the first mega 10 issue story arc Dimension Z, actually an interwoven tapestry of two, readers will see both Captain America taking on Zola's genetic engineering insanity in Dimension Z and an almost pre-Year One type tale. One exploring how a 98-pound guy growing up during the Depression, became a man who insisted on fighting the wrongs of war and didn't stop until he achieved that goal. In stating "He’s everything that you imagine a hero to be" during the interview, Rick literally ripped the money for this series out of my wallet. Not only does that quote perfectly capture the character of Steve Rogers, its also the type of hero we need more adventures of. Add to that Romita Jnr back inked by Klaus Janson and November now has a whole new purpose - the launch of Captain America #1. A 10 issue story arc is perfect. Can't wait to talk about Arnim Zola's breakout party. Cheers OA! Another thing I like about Rick is he always lays seeds in initial arcs that pay off like two three arcs down the road. It reminds you of how comics used to be in a way.